Do you have a strong opinion about the serial comma? Do typos and errors ruin a good article or book for you? If you’re good at finding problems in writing, then starting a home-based editing business could be for you. According to Glassdoor, freelance editors average $51,104 per year, earning anywhere from $15 to $50 per hour. The need for freelance editors continues to be strong, especially as many online publications look to outsource editing tasks, and self-published authors need their manuscripts professionally edited. While editors don’t need to have a specific education, they do need a deep understanding of language, grammar, punctuation, spelling, and style. There are many types of editing work, such as managing editors at magazines or acquisition editors for publishers. However, freelance editors are usually involved in ensuring a piece of work is the best it can be. To that end, they not only clean up errors but also check for clarity and flow. While developmental editors find grammar and typo errors, their focus is more on the content itself. A developmental editor identifies story problems, such as inconsistencies. They also edit for clarity to make sure the reader can understand the idea the writer is trying to convey. Finally, they edit for flow. While flow is difficult to define, you know when a piece doesn’t flow because it feels disjointed or jarring. Developmental editing is sometimes referred to as substantive or structural editing as well. Copyediting involves finding grammar, spelling, punctuation and other mechanical or style issues in the writing. Some copy editors include the checking of facts and verifying the spelling of obscure words or brand names. Many people interchange copyediting and proofreading, but in the editing field, they are two different types of editing. Proofreading comes after copyediting. In most cases, it’s the last edit to find any errors missed during the copyedit, as well as to makes sure formatting is consistent. Proofreaders look for widows and orphans (broken lines or paragraphs), consistent paragraph indents, correct graphic placement, page numbers, etc. An understanding of grammar, punctuation, and the mechanics of writing. Familiarity with style guides, such as the Chicago Manual of Style. MS Word or other document software that allows for “Track Changes” so your clients can see your changes, suggestions, and feedback. 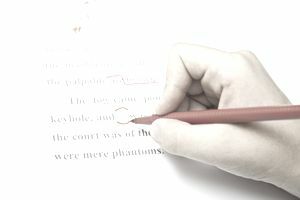 Some editors offer a range of service that includes developmental, copyediting, and proofreading, while others offer only copyediting. It is also a good time to target a specific market. Do you want to do book editing or freelance edit for online media? If you want to book edit, is there a type of book you prefer? Many editors offer a per hour rate. However, most writers like to have a sense of how much the project will cost. To that end, you should know how fast you edit, and then calculate you project rates. For example, if a writer has a 240-page novel and you know you can edit 20 pages in an hour, you can calculate that it will take 12 hours (240 pages divided by 20) to edit the manuscript. If you charge $35 per hour, the total price will be $420. Of course, how long it takes to edit will vary on the level (developmental vs. copyediting) of service you’re providing, as well as the quality of the writing submitted. For this reason, many editors ask to see a sample of the writing before quoting a price. The fastest and easiest option is to operate as a sole proprietor, but for more protection, consider setting up a limited liability company. You can use your given name, such as Sally Smith Editing, or come up with something related to an editing business. If you don’t use your given name, you’ll likely need to file a fictitious name statement (sometimes called an assumed name or doing-business-as statement) with your city or county clerk’s office. Business licenses are obtained through your local city or county business office. You may also need to check with your zoning office, landlord and/or HOA regarding any waivers required for working from home. How will people find you so they can hire you? A fast way is to set up a LinkedIn account that includes all the information about why you’re a great editor. However, for more control and professionalism, create a website that includes a great about me page, a menu of your services, your portfolio, and testimonials. Once you have a place to send people to learn more and/or a way to contact you, it’s time to start marketing. A quick and effective way is to engage your network, letting your friends, family, and acquaintances know about your editing services. While they may not need your services, they may know others who do. Another option is to look for freelance editing work. Many writing related-job sites such as MediaBistro and FreelanceWriting.com list editing jobs. Engaging your network and applying for freelance editing gigs is a great way to get started, but to have more control over the work you do, and to be able to charge more, marketing your business is the best way to find your ideal clients. There are many ways you can market your business. The best thing to remember is to consider your target market, where it can be found, and how to attract it to your services. For example, if you’re offering book editing services to indie fantasy authors, make a list of places these writers can be found. Online, this can be in fantasy writing forums and indie author groups. However, they may also attend writing and book conferences. Other ways to connect with your target market include social media, speaking at writer events, writing articles for writing blogs and magazines, and being a guest on writing podcasts. Whatever strategies you use, start by making a marketing plan, and then work your plan every day.